Ngawang comes from long line of famous Nomadic singers in the Amdo region of Tibet – a beautiful but harsh environment known for fine horses and wild grasslands. His family herded Yaks & sheep and taught Ngawang his unique repertoire of mountain songs from an early age while he was carried by day on his mother’s back as she tended their herds. Each evening Ngawang’s musical education would continue further when his family would sit & share stores about noble Tibetan folk heroes defeating cruel Warlords and sing songs in praise of the snow mountains – after which his brothers would instruct him in the ancient art of the Dramnyen six-string lute. In accordance with Tibetan tradition, being the youngest son, Ngawang joined Achok Gonpa Monastery and became a Monk when he was 14 years old, studying the teachings of Gelugpa (Yellow Hat) Buddhism for five years. Presented with an opportunity to escape Chinese repression, Ngawang de-robed and finally settled in the UK in 2004. 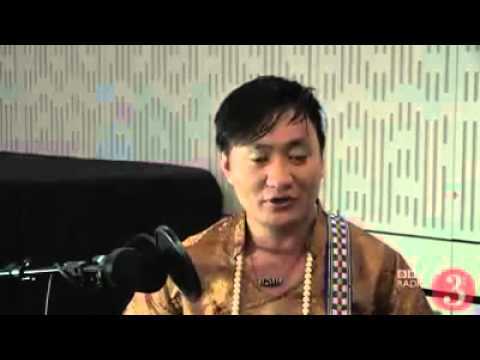 He has been performing across Europe for the last decade as a highly sought after singer amongst the Tibetan community in exile, appearing at festivals in France, Belgium, Switzerland and Spain.